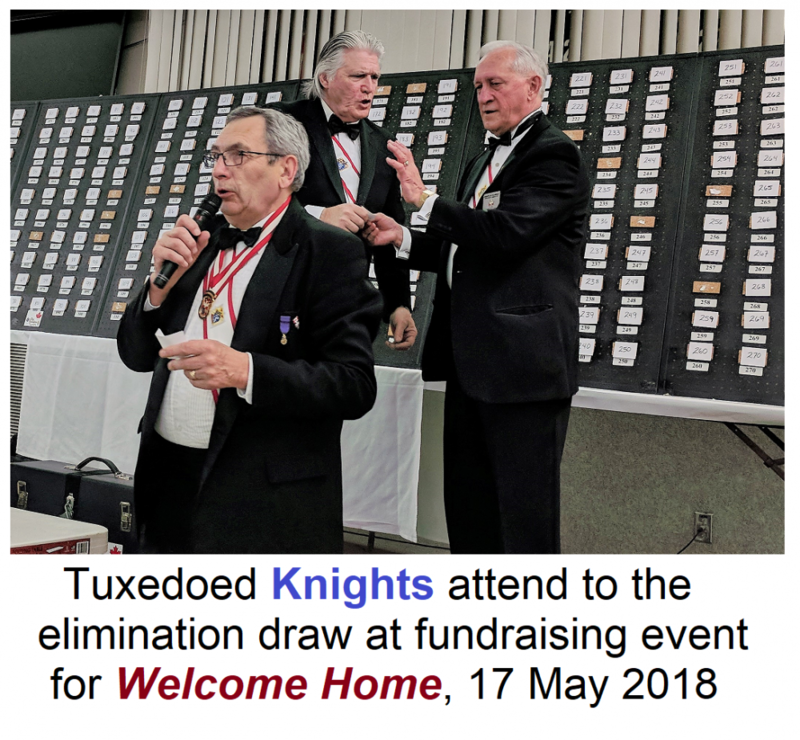 The Knights of Columbus 4th Degree Canon Luhovy Assembly #374 holds a Charity Dinner and Draw every year. This year they designated the Redemptorist Fathers' mission "The Welcome Home" as the recipient of proceeds of the fundraising event. The event, which was held at the Sts. 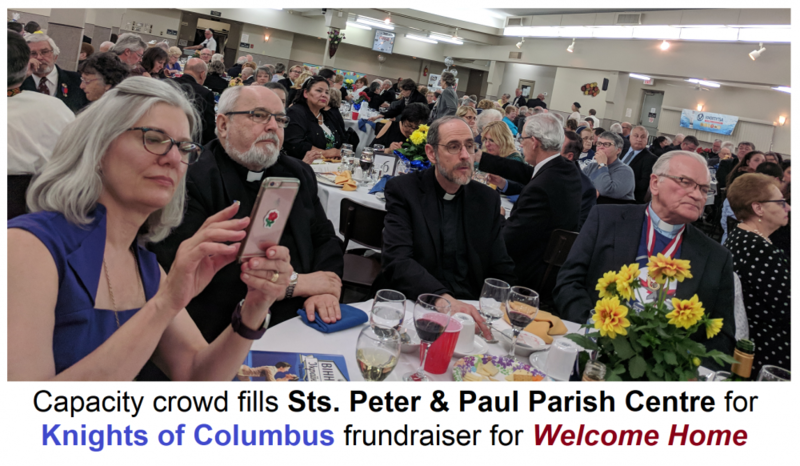 Peter and Paul Parish Centre in St. Boniface, included a banquet dinner, an elimination draw, lottery prizes and a Khortytsya fundraising opportunity. The Master of Ceremonies was the Faithful Navigator of the Canon Luhovy Assembly, Bro. Rick Veale. He fulfilled the task well - at one point even leading the gathering in a rendition of "Whatsoever you do for the least of my brothers". After the social hour, the evening formally began with a prayer offered by the Provincial Superior of the Redemptorist Fathers in Canada - Fr. 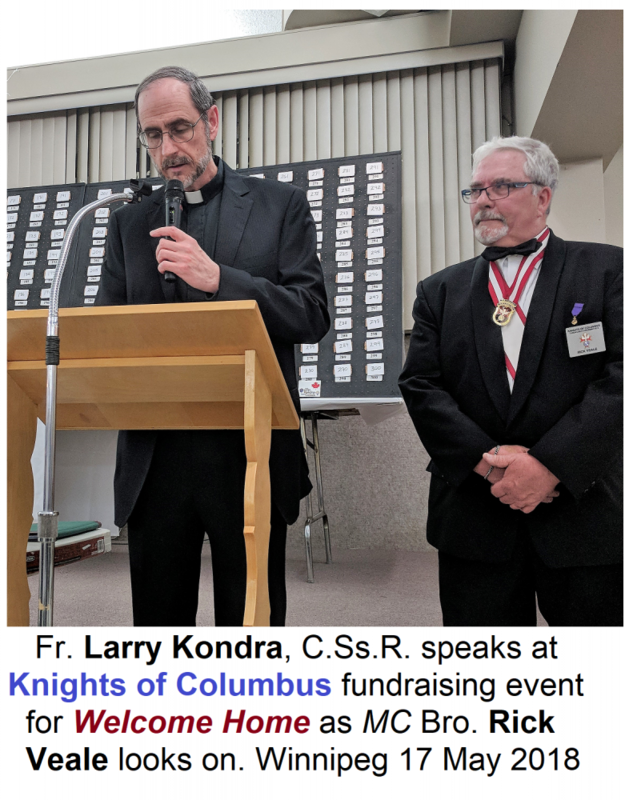 Larry Kondra, C.Ss.R. 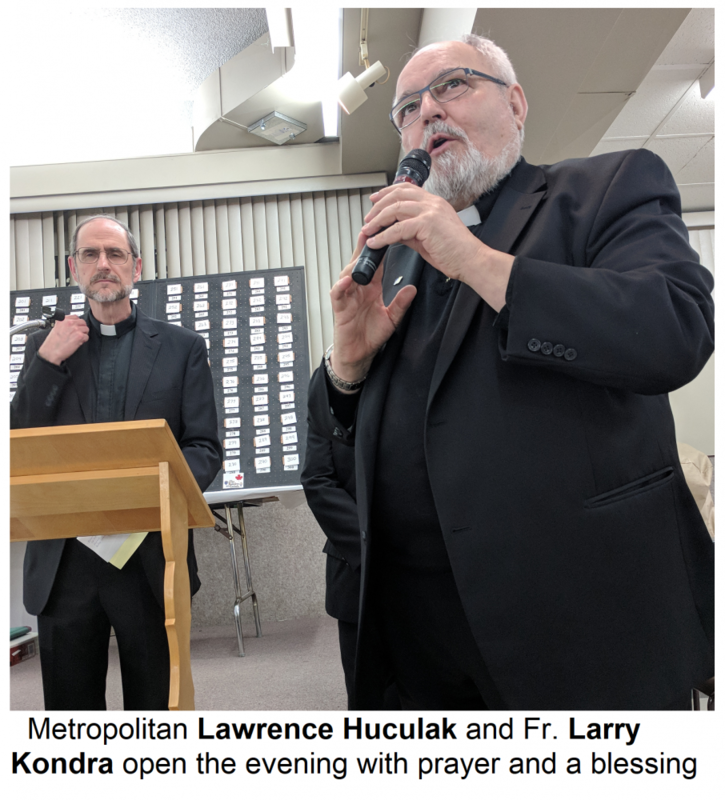 and a blessing given by the Archbishop of Winnipeg, Metropolitan Lawrence Huculak, OSBM. After all the guest tables had the opportunity to take advantage of the incredible buffet meal which was served by Budget Catering, a program of speakers and visual presentations began. Father Larry Kondra, who has been associated with The Welcome Home since it began in 1993, gave opening remarks in which he outlined the history and the ongoing mission of centre. As a person who benefited from the ministries of Welcome Home, Flora spoke at length about her experiences and those of her family. She was grateful for all the material and social benefits, but, interestingly, especially for the Bible study and prayer that she encountered. She noted that she had a lot of confidence in the prayer of Fr. Larry. A Welcome Home volunteer from Colorado, Noel, spoke about his experiences and how it all helped his discern his vocation in the religious life that he is presently pursuing. 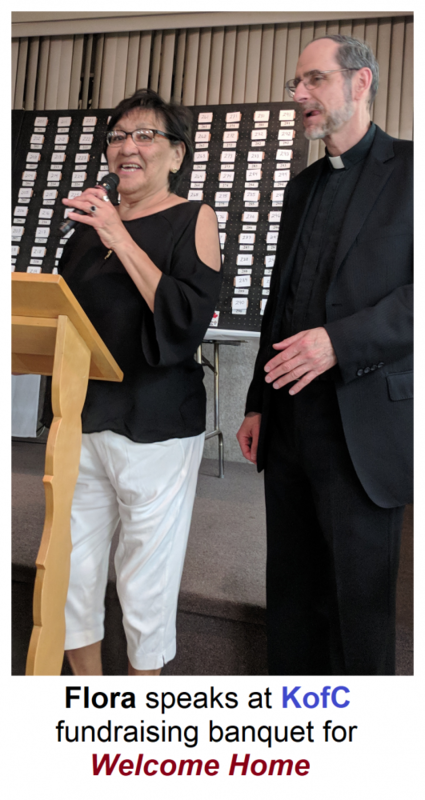 The Community Director of Welcome Home, Delores Courchene, presented some of the inspiring statistics of the mission, demonstrating how many lives were touched over the years. As they spoke, a fascinating collection of photos were projected on a screen at stage. After this, a video about The Welcome Home, that was made by Noel with his original song, was also screened. Following the meal, Fr. Isidore Dziadyk, OSBM, the Faithful Friar of Canon Luhovy Assembly (who to the delight of everyone wore a Winnipeg Jets hockey jersey), concluded with some remarks and a closing prayer. 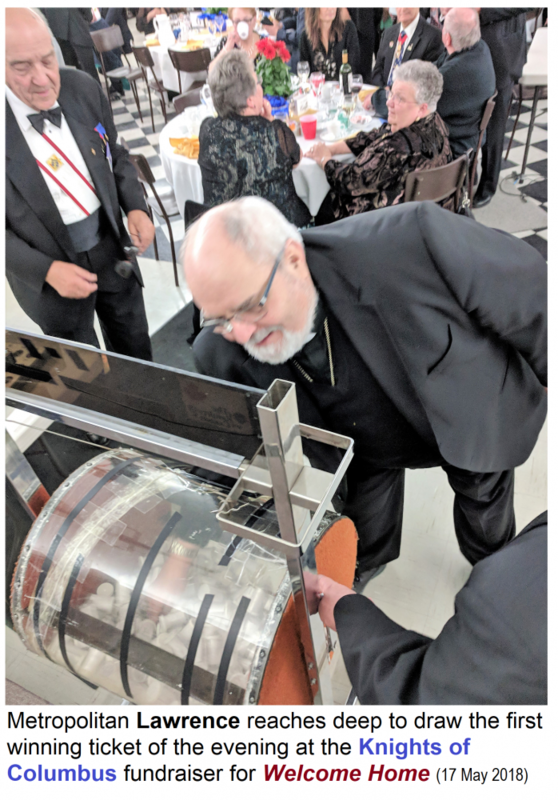 Immediately following this, Metropolitan Lawrence drew the first tickets of the elimination draw and the charity draw was under way. This was followed by the Lotto Draw and the 50/50 Draw. It was a beautiful evening and everyone was grateful to be a part of the opportunity to support a truly worthy cause here in Winnipeg.